Al Brown asked whether this could be an actual sketch by Joshua Reynolds, as the work relates to his painting ‘Lady Hamilton as a Bacchante’, but was unlikely to be a copy due to significant differences such as the omission of the garland on the woman’s head. 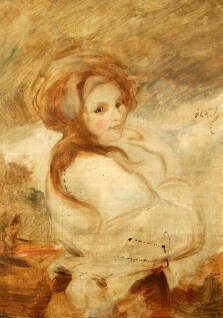 Rohan McCulloch opened the discussion by suggesting that the sketch is more like the work of George Romney, evident in the stylistic similarities with some of his sketches sold at Christie’s. Nevertheless, despite the contributions of other Art Detective users, no further information was found to indicate that the artist of the sketch was Romney. Looking at Reynolds’ painting Charity, in the collection of The Ashmolean Museum, Osmund Bullock also pointed out that there are differences between his finished work and this unknown sketch, stating that the sketch was certainly a loose early concept if it was by Reynolds. Pieter van der Merwe mentioned that there are several copies of Reynolds’ finished painting, such as the one at Waddesdon Manor by John Rising, who nonetheless seemed unlikely to be the artist of this sketch as he mostly worked in watercolour. Pieter and Barbara Bryant (Art Detective Group Leader for Portraits: British 19th C) both confirmed the sketch to be a copy of the original painting, citing the fact that Mannings and Postle’s catalogue of Reynolds’ works does not list this work as by him. As the sketch entered Manchester Art Gallery’s public collection in 1976, they would certainly have known about it by now. Research into bequests to Manchester Art Gallery confirmed that it was bequeathed by Wilfrid Rene Wood (1888–1976), with Fine Art Curator Hannah Williamson adding that it was possibly a keepsake that came along with the sizeable cash legacy that the artist left to the Gallery. As such, the discussion concluded that, based on the similarities, the sketch’s title should be changed to Emma Hart (c.1765–1815), later Lady Hamilton, as a Bacchante (after Joshua Reynolds) by an unknown artist. Could this be an actual sketch by Joshua Reynolds?